Discover the luxury of being treated like royalty at Centara Ras Fushi Resort and Spa. For a lavish experience, book the deluxe sunset water villa, which also includes a hammock and a jacuzzi and offers stunning sea views. Savor an array of sumptuous food and drinks and later indulge in a luxurious spa treatment. The hotel also provides snorkeling equipment for added fun. 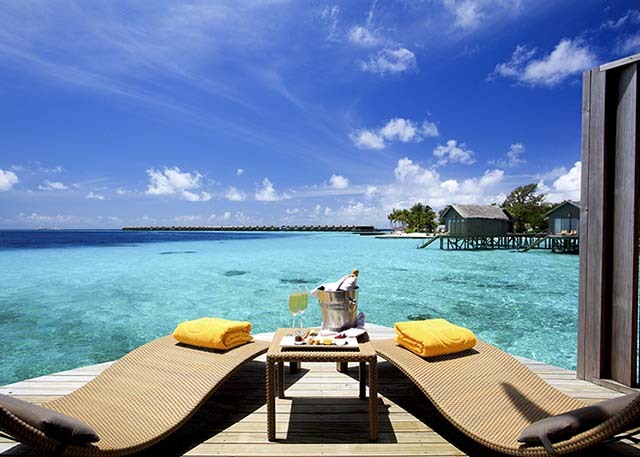 Offering luxurious over-water accommodation, Centara Ras Fushi Resort & Spa Maldives is a striking 5-star property. The hotel comes with quality services and exceptional amenities. Welcoming its guest with warm hospitality, it accommodates couples, families and solo travelers. Boasting of its beachfront location, the hotel maintains ocean-front spa, a PADI-certified dive center, and an outdoor pool. Moreover, it also maintains six on-site bars and restaurants. Providing guestrooms with ocean view, the property has well-furnished accommodation options which are equipped with all the necessary facilities. Further, it offers caring hospitality and unparalleled amenities. Centara Ras Fushi Resort is 15-minute boat ride from Giraavaru Cave and Kuda Haa. Moreover, Kiki Reef and Shark Point are also not far from the property. Other than this, the property is located at a distance of just 12 km from Velana International Airport that offers an airport shuttle at an additional cost to all its guests. Want best Male Packages with this Resort? The adult only hotel offers 140 villas. All the villas accommodate 2 adults only. It offers Deluxe Water Villa, Premium Sunset Spa Water Villa, Ocean Front Beach Villa, Deluxe Ocean Front Beach Villa, Deluxe Sunset Water Villa and Deluxe Spa over Water Villa. All the air-conditioned rooms are equipped with a TV and offer breathtaking views of the blue lagoon. The beautifully decorated rooms are equipped with private bathrooms having either a shower or spa bathtub. In-room dining is possible with room service at Centara Ras Fushi Resort Maldives. Proudly boasting of its extravagance facilities and finest services, Centara Ras Fushi Resort & Spa Maldives is one of a kind. The property proudly boasts of its spa and wellness center that offers various massage therapies to its guests. One can indulge in swimming and can enjoy a number of beach sports during the stay. Guests of Centara Ras Fushi Maldives can take advantage of concierge service and luggage storage on site. Moreover, the facility of a 24-hour front desk is also provided to all the guests so that they can get a personal assistant. The hotel has a tour desk for providing travel-related information and ticketing service. It also has a fitness center where guests can indulge in a full body workout. Moreover, it offers yoga classes, airport shuttle, and boating facilities to all its guests. Daily maid service, Ironing service, and dry cleaning are also provided. Centara Ras Fushi Resort & Spa Maldives features multiple in-house restaurants offering a range of local international dishes. It has six on-site restaurants and bars that serve the finest cuisines. One can choose to head to Viu Bar, Waves Pool Bar or Giraavaru Lobby Bar enjoy some refreshing cocktails and drinks. Moreover, to try Thai specialties, one can visit Suan Bua. One can enjoy grilled meats at Al Khaimah while Italian cuisines are served at La Brezza. With so many dining options to choose from, guests can indulge in a wide variety of delicacies. One must plan a stay at Centara Ras Fushi Resort Maldives to spend some of the most beautiful moments with family and friends. The hotel can offer its guests complete comfort and a fun-filled experience. Also, its exotic location makes it just the right place to spend holidays in Male. How far is Centara Ras Fushi Resort from the International airport? Centara Ras Fushi Resort & Spa Maldives is located at a distance of 12 km from Velana International Airport. Does Centara Ras Fushi Resort offer airport transfer facility? Yes, the resort provides airport transfer facility to its guests. What are the activities one can enjoy at the resort? One can enjoy a variety of dishes at the in-house restaurant. Guests can explore nearby markets or can go shopping or sightseeing. Moreover, one can avail spa therapies during the stay or enjoy a swim in the pool. Does the resort offer free Wi-Fi facility? Yes, the resort offers complimentary internet access to all its guests. Does Centara Ras Fushi Resort have a tour desk? Located in one of the finest locations of Maldives, Centara Ras Fushi Resort & Spa Maldives is an ideal place for business travelers and couples. One can feel the warmth and experience the true beauty of this place while being surrounded by the vibrant ambiance. The hotel also offers heart-warming hospitality with a team of cordial staff. Apart from maintaining beautifully designed rooms, it offers a complete package of fun with absolute comfort. Other than this, one can indulge in mouth-watering cuisines and beverages at the restaurants. Offering a beautiful blend of tranquillity, simplicity and exceptional hospitality, Centara Ras Fushi Resort & Spa Maldives promises to offer innumerable memories to its guests with facilities like a swimming pool, fitness center, and spa treatments. One can surely enjoy a memorable experience at this luxury resort.